Meet at the Elmwood Community Gardens! 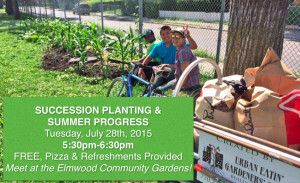 A SUCCESSION PLANTING & SUMMER PROGRESS Workshop will be held on Tuesday July 28th, 2015 5:30pm-6:30pm. It is FREE and Pizza & Refreshments will be Provided! We will discuss using succession planting to boost your garden harvest. Bring all of your gardening questions, and tell us how things have been going in your gardening world this year! Comments Off on Meet at the Elmwood Community Gardens! 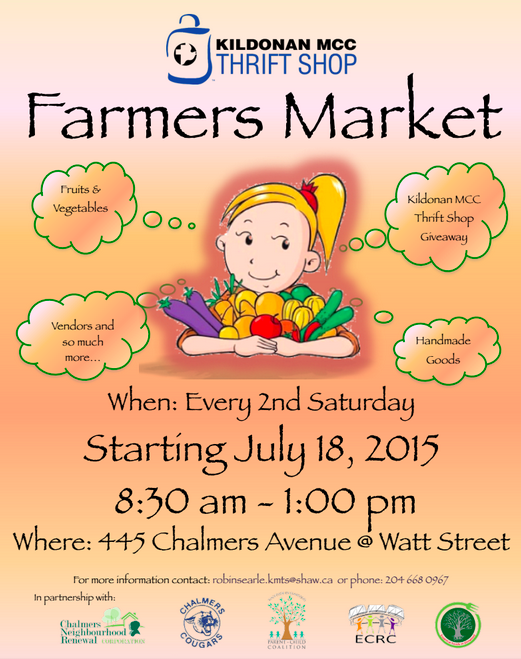 Our Neighbourhood’s Farmers Market is Back by Popular Demand! 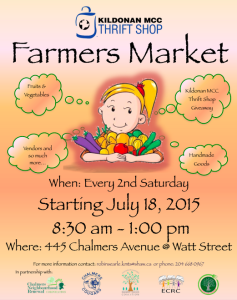 Join us every second Saturday starting July 18, 2015 at 8:30 am – 1:00 pm in the parking lot of Kildonan MCC Thrift Shop (at the corner of Watt and Chalmers Ave.). Comments Off on Our Neighbourhood’s Farmers Market is Back by Popular Demand! FREE Summer Program for children from 5-12 years-old! 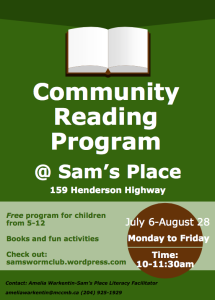 Join the Community Reading Program at Sam’s Place! This is a FREE Summer Program for children from 5-12 years-old. There will be books and fun activities! Comments Off on FREE Summer Program for children from 5-12 years-old!